Impress your guests with your chrome pub table. This fully functional pub table will be a stylish accent to your game room, garage or collection. The table top is customizable with the logo of your choice, trimmed with chrome finished plastic banding. The table top is supported by a chrome base that is both lightweight and durable. It features an adjustable foot rest for customizable comfort. 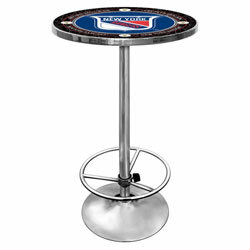 Bring style, function and comfort to your game room, garage or collection with your custom chrome pub table. Table Top Dimensions: 27.375" x 27.375" x 1.25"
Overall Dimensions: 27.375" x 27.375" x 42"